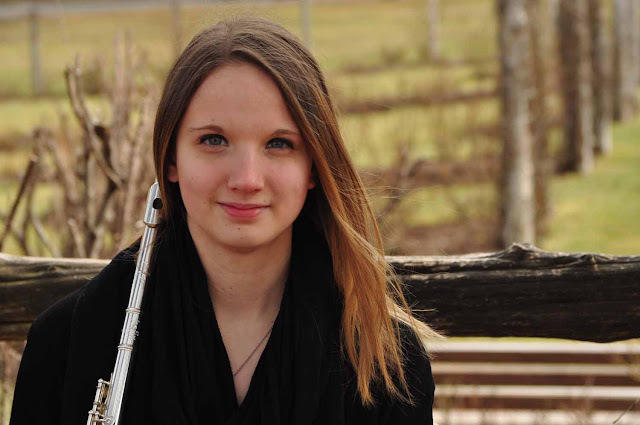 Flutist, Krystal Ankerbrand is currently pursuing her Master of Music at The Hartt School in Hartford, CT where she is a student of Janet Arms. Ms. Ankerbrand completed her Bachelor of Music at James Madison University in Harrisonburg, VA where she studied with Beth Chandler. She has also taken lessons with Jennifer Kuk-Bonora, Elizabeth Brightbill, Alicia Kosack, and Alicia Christenbury. Ms. Ankerbrand recently performed as a member of the James Madison University (JMU) Wind Symphony at the 2015 College Band Directors National Association national conference in Nashville, TN. In the past, she has held the position of principle flute of the JMU Symphony Orchestra, JMU Chamber Orchestra, and the JMU Symphonic Band. Ms. Ankerbrand is highly involved in chamber music. At JMU she was a member of a woodwind quartet that was selected to perform in a masterclass with the Calefax Reed Quintet. At the Hartt School, she is currently a member of a woodwind trio as well as Duo Vento, a flute and guitar duo. In 2014 she was selected as a winner of the National Flute Association Colligate flute choir Competition and performed with the ensemble during the Chicago convention. She has attended various summer music programs including Trevor Wye’s Boston Masterclass: Preparing for Employment and Baylor’s Summer Flute Seminar. Ms. Ankerbrand has been selected to perform in various masterclasses with renowned artists such as Paula Robison, Trevor Wye, Barry Green, Marianne Gedigian, Jim Walker, Amy Proter, and Judith Mendenhall.